While we are busy bundled up for winter, the Living Stones children are on summer vacation. Everyone knows the best part of summer vacation is camp, and it is no different in Brazil. Churches in Brazil normally plan their summer camp during the festival of Carnaval, as it is a five day vacation, and there are many dangers associated with the holiday (namely with drugs, alcohol, and prostitution) that they can get away from. In Cajueiro Claro, there are ten children from Living Stones who would REALLY like to go to Carnaval camp. We have set up a scholarship program where the children work hard learning Bible verses and helping out during the camp. The church is also making and selling food at a food tent for a local holiday to raise funds. Would you like to help provide some scholarships? It is $30 a scholarship, or $300 to make sure all ten children can go*. We wanted to take some time during this season to reflect and say thank you--or "Obrigado" in Portuguese. From our Living Stones family to yours, Happy Thanksgiving. Please take a minute to hear our gratitude and celebration on all God has, and is, doing. Children's Day (October 12th) is about parties and presents and celebrating being a kid: but for many of the Living Stones children, their families don't have the finances to celebrate. Five communities, through four different parties, reached out to over 250 children, sharing Jesus' love, the gospel, and the joy of childhood. But this year, we took it a step farther, changing the focus from "What can I get?" to "How can I share?" The children at the International school worked for weeks, setting up a special party for the kids at Cajueiro Claro Living Stones. They gave so many presents that the Cajueiro Claro kids decided to keep a couple of the presents, and save the rest for a Christmas party for the whole community: spreading the joy. In Guadalajara and Lagoa de Itaenga Living Stones, the teens came together to help run the parties for the younger kids, and, as God always does, left being blessed for giving rather than receiving. Thank you for being a part of Living Stones, and joining with us as we find new ways to answer "How can I share?" Please take a minute to watch the videos below, and let us share with you some of our joy. Keep us in your mind and prayers as the end of the Brazilian School year (December) and Christmas are coming up, with more opportunities to share Jesus. Samuel is new to the Cajueiro Claro community, but he quickly joined Living Stones, and started attending church. Soon after, his father came too. Last week, after the service, Samuel's father raised his hand to accept Christ. He is also beginning discipleship with one of the other men at church. We are excited and amazed at how God works! At Lagoa de Itaenga, there is a Living Stones sports ministry, a teen sports program, and a men's soccer ministry: we are so excited to hear that this month, 11 men gave their lives to Christ! This weekend World Renewal Brazil is celebrating 25 years of ministry. We are amazed at what God has done. After five years of church planting, God made it clear to the World Renewal leaders that we needed to build our churches, communities, and future: through Living Stones. We are so excited to be a child sponsorship program that invites you in to get an intimate look at what we do, how we do it, and how you are a crucial part of what is happening. Thank you for partnering with us! 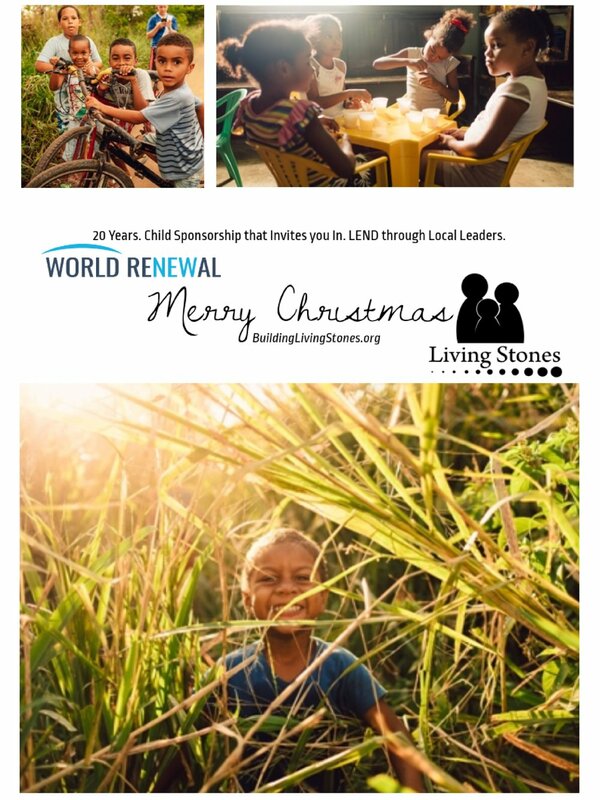 Living Stones is a child sponsorship program that invites you in. We invite you in to make a difference in children's lives, but also get to know us personally. Every year, multiple short term missions trips come to Brazil through World Renewal International to serve others. These trips make a huge impact in the lives of the Living Stones children as they get to meet the people who love them from across the world. When are you coming? What does success look like for Living Stones? What are we aiming for? Camila was our shinning star at Cajueiro Claro. She gave her life to Jesus at Living Stones. She learned how to play the guitar there, and then started leading worship. Then she started leading the worship team. And then, she decided to leave. At Living Stones, we are working to build tomorrow's leaders: leaders in the community, leaders in the church: it just might not be our church. Leadership doesn't always look like we want it to, but when you look at Camila's life, you see success. This was our 8th annual Trek for Transportation, and our best attended event yet! We loved being able to have the director (Tele Moraes) and founder (Assuerio Naque) of Living Stones at the event! Thank you for all of those who made this possible, and those who donated to getting our van! We had wonderful celebrations at Cajueiro Claro, Guadalajara, Lagoa de Itaenga, and the Trash Dump community. In many of the places, we made candy flowers for the kids to give to their mothers. Thank you for helping to make these special moments for moms! Each of our locations--and at the trash dump outreach--had fantastic ministries and outreaches to their communities: committed to sharing Christ during the Easter season! Super excited to have Tele at our Trek this year--along with some other SURPRISE Brazilian guests! Come, race, and picnic with us! We have a big goal this year: $25,000 for a van--let's make it happen! Register under the "Trek for Transportation" tab! A Six Year Old Dream comes TRUE! NEW PARTNERSHIP: Guadalajara Living Stones is connecting with World Help to serve 60-100 kids almost every day. OLD DREAMS: After laying the foundation for a second classroom six years ago, we are ready to start building, to make room for our new teachers! To utilize this partnership, and to build this classroom (and mini-kitchen for serving food), we need $5,000. Would you like to be a part of this great new chapter of ministry at Guadalajara Living Stones? If you would like to receive a printed copy of our annual report, please write to amobrasil99@hotmail.com. If you would like to see more, here are the year in review videos from Cajueiro Claro, Guadalajara, and Lagoa de Itaenga. Thank you for another amazing year--and to all that God has for us in 2018! Luiz is Excited about Children's Day! Luiz Fernando, like every other child at Living Stones, is anxiously awaiting October 12, which is Children's Day in Brazil. When Luiz started coming to Living Stones three years ago, it was the last hope for his parents. Luiz suffers from some difficult learning disabilities, as well as being mildly autistic. He lived in his own little world, and refused to come out at school or at home. One of Luiz's gifts is creativity. Instead of doing classwork, he would take his worksheet and twist, tear, and turn it until he had created a dinosaur or other creature. Instead of disciplining Luiz, the Living Stones workers patiently saw his talents and used them to slowly draw Luiz out of himself. Now, during breaks, you can often find Luiz Fernando surrounded by friends, still creating interesting art pieces. Thank you for your support of Living Stones, that enables transformation stories like Luiz. He is succeeding at school, at home, and at Living Stones: physically, spiritually, and emotionally. Come alongside us as we celebrate these kids and these successes for Children's day--as well as have a time to share Jesus with the whole community! You can donate to our special events at the link below.